"Torn apart by betrayal. Separated by war. Bound by love." The movie Atonement tells a captivating story that combines war-time drama with a timeless love story. The film tells the love story of Robbie, played by James McAvoy, and Cecilia, played by Keira Knightley; however, the story is told from the point of view of Cecilia's younger sister, Briony. One evening when Briony, a young aspiring writer, is just thirteen years old, she reads a note that she is supposed to deliver written by Robbie and intended for Cecilia. The note expresses Robbie's desires for Cecilia, which are misinterpreted by Briony, who does eventually deliver the note to her sister. Later that night Briony witnesses a sexual encounter between Robbie and Cecilia and begins to believe that Robbie is a sexual deviant who is attacking and taking advantage of her sister. Even later in the evening Briony's cousin is assaulted, and Briony informs police that she saw Robbie committing the act, as a way to avenge what she had seen Robbie doing to Cecilia earlier in the evening. The police arrest Robbie, taking him away from Cecilia for an extended period of time. The story picks up a few years later as Robbie has finally been able to reconnect with Cecilia after a long absence but is once again forced to leave her, this time to fight in the war. Meanwhile, an older Briony is working as a nurse, taking care of wounded soldiers. It is here that she begins to realize how badly she misinterpreted the events of that night years earlier and how much she hurt her sister and Robbie. After realizing how she changed Cecilia's and Robbie's lives for the worse, she sets off to somehow atone for her past mistakes, hoping it's not too late to fix her mistake. 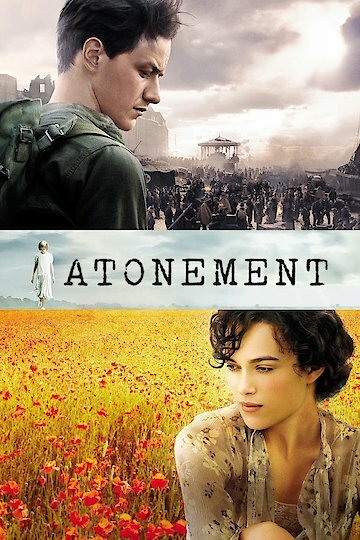 Atonement is currently available to watch and stream, download, buy on demand at Amazon Prime, Starz, Vudu, FandangoNow, iTunes, YouTube VOD online.